Have you ever wondered what would happen if you left yarn or fabric out in the elements for an extended period of time? While sprucing up my backyard a few years ago, I tacked up one of my weaving projects on a bulletin board, along with two other pieces. I was inspired by “Guerilla Art Is,” Fred Free’s article in the July/August 2010 issue of Cloth Paper Scissors, a mixed media magazine. This is what the project looked like recently, after spending some time outdoors. 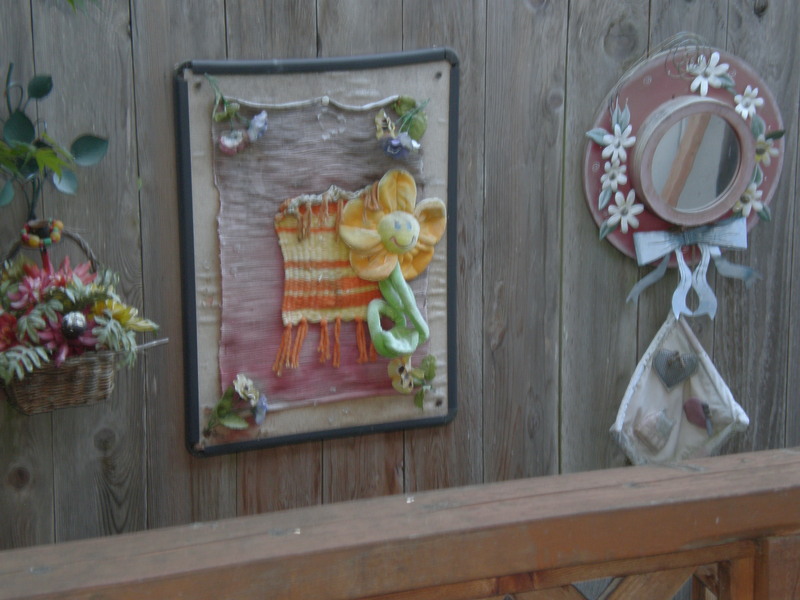 The project sits on my backyard fence between a plastic basket of flowers and a secondhand mirror with various fibers attached. I don’t recommend leaving yarn and fabric out in the elements unless it was intended for that purpose. Art from my backyard. I wove the yellow and orange piece, attached to the bulletin board.